As the creator of an iconic coin design is honoured on the anniversary of his death this Saturday (September 16), The London Mint Office is offering a brilliant uncirculated solid gold quarter sovereign designed by one of his descendents and highly sought after by collectors, for just £99. 2017 is the bicentenary of one of the most famous coin designs in the world. In 1817 the Italian sculptor and engraver Benedetto Pistrucci (1783-1855), described at the time as “an artist of the greatest celebrity” created an iconic depiction of Saint George and the Dragon which continues to be struck on gold sovereigns to this day. Pistrucci was buried in Christ Church, Virginia Water in Surrey, where a plaque will be unveiled in his honour this weekend. To mark this important anniversary, The London Mint Office has commissioned internationally renowned Canadian artist Angela Pistrucci to create a new interpretation of her great-great-great-great uncle’s most enduring work. 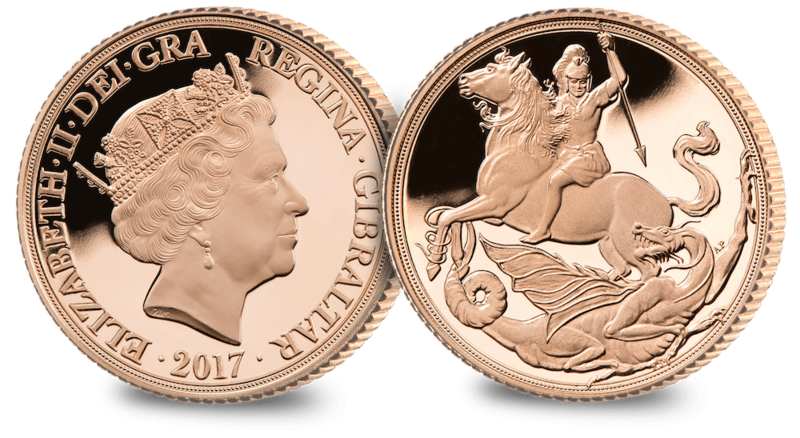 The Government of Gibraltar obtained permission from Buckingham Palace to use Angela’s design on their 2017 gold sovereigns, and the new coin was unveiled to great acclaim at the 46th World Money Fair in Berlin earlier this year. Exclusively available from The London Mint Office, the 22 carat gold quarter sovereign pays tribute to Benedetto Pistrucci’s most famous design and is being offered at a very special price. To prepare herself for this unique opportunity to follow in her ancestor’s footsteps, Angela won a scholarship to study Bas Relief in Rome at the prestigious Italian Mint IPZS which has an archive of Benedetto Pistrucci’s work on permanent display in their museum. Like her famous ancestor, Angela’s work has also been exhibited throughout the world. The full range of sovereigns featuring Angela Pistrucci’s new interpretation of Saint George and the Dragon are exclusively available in the UK from The London Mint Office. To obtain your gold quarter sovereign, please call 0808 178 2370 (lines open Monday – Friday 9am-5:30pm & Saturday 9am-1pm).